Ten years ago for Ray Huffmasters 40th birthday he was given a 3-day Derek Daly racing school from his wife Kim Huffmaster. Little did she know what could have possible come from it. After being hooked by the racing school, Ray quickly searched for a race car to buy and race at Waterford Hills raceway which happened to be only fifteen minutes from his home. Several championships later in a Mazda Rx-7 ITS Speed Source built car and the addition of his son Rob Huffmaster racing with him in the highly competitive Spec Miata class lead to a brief stint in the Grand-am Cup ST class racing with the Factory Mazda Speed source team. In only five races the duo managed three top 10's. Ever since the first year Ray Huffmaster started racing SCCA club racing he had always watched the prestigious SCCA Runoffs National Championships and in 2007 Huffmaster Racing took a run at the T3 class with driver Rob Huffmaster. 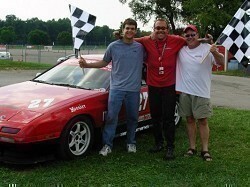 After a hard fought rain race, Rob was able to bring Huffmaster Racing the T3 SCCA Runoffs National Championship. Huffmaster Racing now focuses on SCCA Runoffs National Championships.